The many rumors are true: Panasonic is releasing a full-frame mirrorless camera in 2019. Going under the moniker of the Panasonic Lumix S, the camera is currently in prototype stage but will be on show off at Photokina 2018. Panasonic joins a growing group of full-frame fans. Sony is currently top of the crop, but the likes of Nikon and Canon have entered the full-frame fray and now Panasonic is trying its hand at this format of camera, despite being a fully fledged advocate of Micro Four Thirds. There will be two full-frame mirrorless cameras launched by Panasonic in 2019: the 47-megapixel Panasonic Lumix S1R and the 24-megapixel Panasonic Lumix S1. The new Panasonic S-mount lens will be the same L-mount system developed by Leica, and which now will be supported by both Sigma and Panasonic. The Panasonic Lumix S1R comes with a 47MP sensor, dual image stabilisers, 4K video (shot at 60fps), speedy autofocusing and it will have an electronic viewfinder. And there’s also 50p 4K recording available – Panasonic has pointed out that as of this moment, these are the first full-frame, mirrorless interchangeable lens cameras to offer both these 4K recording options. Panasonic is claiming that the electronic viewfinder (EVF) will have a higher resolution than what the Nikon Z7 and Canon EOS R have on board, but exact specs are thin on the ground at this moment. The Panasonic Lumix S has a smaller megapixel count at 24MP, but the rest of the specs are said to be similar. 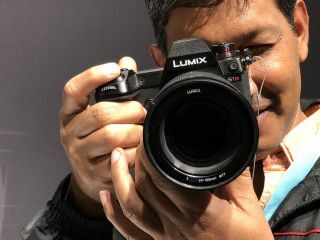 The new pro cameras will see Panasonic set up Lumix Pro – a support service for professional photographers, along the lines of similar services already offered by Canon, Nikon and Sony. Another thing Panasonic is calling a world’s first – these will be the first full-frame cameras to be equipped with Dual Image Stabilisation technology, as seen on flagship models like the GH5, providing extra latitude for handheld shooting in low-light environments. Both cameras will bear dual slots for XQD and SD memory cards – a first for Panasonic, and something many people criticised Nikon’s full-frame mirrorless Z range for lacking (its Z7 only sports a single XQD slot). The rear LCD will be a ‘rugged, triaxial tilt model’– a three-hinged mechanism that appears to give a large degree of manoeuvrability over the positioning of the screen.